104.5″ long tabletop plateau, in five sections, complete with 12 crystal side bowls. The plateau can be shortened by removing one or two sections. Each end section is approx 23″ long, and each of the middle sections are approx 19.25″ long. The maximum width of the plateau at the base is approx 23.5″ from the toes of the ladies on each side, and the maximum width over the bowls at the top is 26″. The width of the grape & vine decorated gallery is approx 19″. The maximum height to top of the bowls is 12.5″. 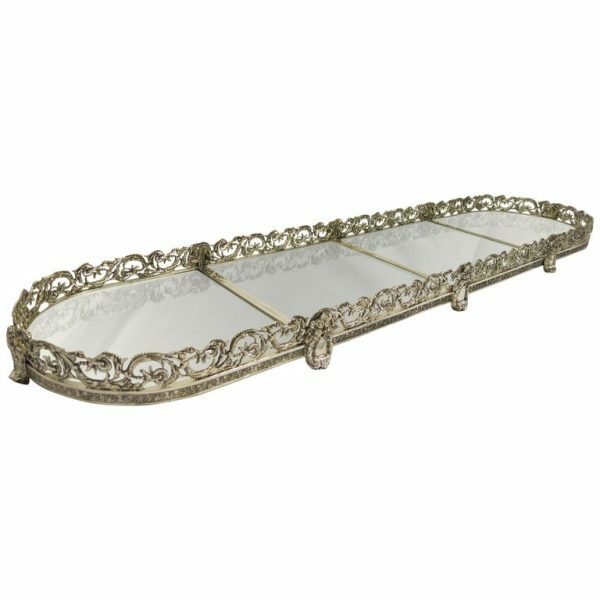 Three section, silver plated, mirror topped, table plateau. Measuring total length is 50″ x 17″ wide. Just one of a selection of plateau available in silver plate as well as sterling. A three section, extendable, sterling silver table plateau. Made in Belgium by the one of the premier silversmiths, Delheid Freres. The plateau is actually the highest grade of silver, being of 950 standard, which is higher than the 925 sterling standard. Made in Brussels, Belgium, circa 1900. Each section with the “A” assay mark for Belgium and 950 for the high standard. The D with the Serpent above is the mark for Delheid Freres. The three sections are 45″ long and for a larger table they can be spaced further apart. The Brussels house Delheid, considered the second best Belgian silversmiths, was founded circa 1828 by Michel Delheid (1802-1872). In the period 1829-1838 he worked at the Rue Des Minimes in Brussels. In 1842 he registered his maker’s mark, and moved to Nieuwlandstraat. In 1862 two of his sons, Edmond-Joseph and Alphonse-Jules-Jean-Baptiste, gave the company its final name Delheid Frères. They registered the capital D under a serpent, makers mark. The company again moved circa 1898 to Artesiëstraat ; finally in 1897, a store on Augustijnenstraat was opened. The company increased production in the early 20th century, and they were still silversmithing up until late 1970s. Silver items made by Delheid Freres can be seen at the Silver Museum housed in the castle Sterckshof in Deurne, Antwerp. A Highly Decorative Four Section Silver Plated Table Plateau. Each Section Is Approx 16 1/4″ Long. By Removing One Section, The Plateau Can Be Used As A 3 Section Plateau. In The Center Of A Dining Table Or On A Sideboard, This Plateau Will Really Make A Statement And Complement Any Style Of Room. Original Used In The Center Of Large Tables To Add Importance To The Room, Can Be Used Under An Epergne Suite, Or Candelabra Suite, Or Even For Food, Fruit Or Flowers. The Mirrored Top Will Reflect Light Back Into The Room. Many Other Plateaux Available In A Variety Of Styles, Sizes, Ages & Price.. Feel Free To Contact Us For Further Details On This, Or Any Other Silver Requests. 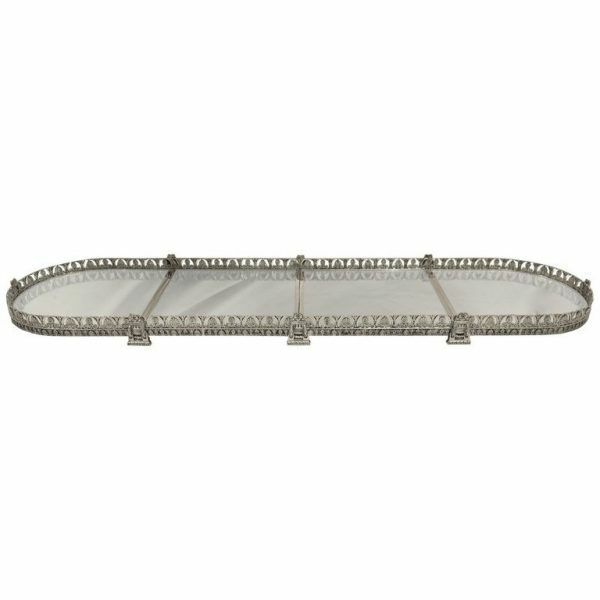 Check Our Web Site For A VERY SMALL Selection Of Our Huge Inventory..
4 Section, Grape & Vine Border, Silver Plated Mirrored Top Table Plateau. 66″ x 18″ x 3.75″ High. Can Also Be Used With Just 3 Sections. Excellent quality, condition & style.